If you’re working on a remodeling project that calls for removing old woodwork, here are some tricks from the pros to keep it intact so you can reuse it. Woodwork is attached with finish nails, which are specially designed with narrow heads so they’re not as easily seen. That narrow head actually works in your favor when it comes to removing them. Score the paint with a utility knife first if necessary to keep from splitting the wood. 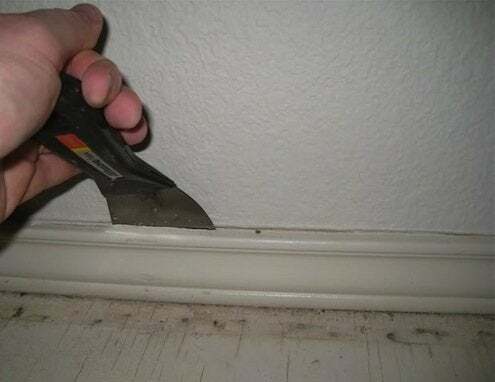 Starting near, but not at, the end, carefully pry the woodwork away from the wall, using a block or a putty knife behind your flatbar wherever you need to protect the wall. Work as close to each nail as possible, pulling straight out to keep from bending the nails and breaking the piece. Once it’s off, grasp each nail on the unfinished side of the wood with a pair of locking pliers and pull it through backwards. You should be left with nothing but a small hole in the finished face of the woodwork.